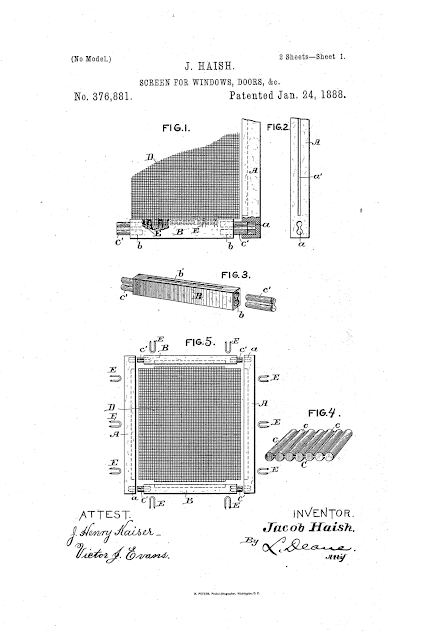 Jacob Haish had the creative, working mind of an inventor. If he thought there was a better, more efficient way of doing something, he was going to discover it. 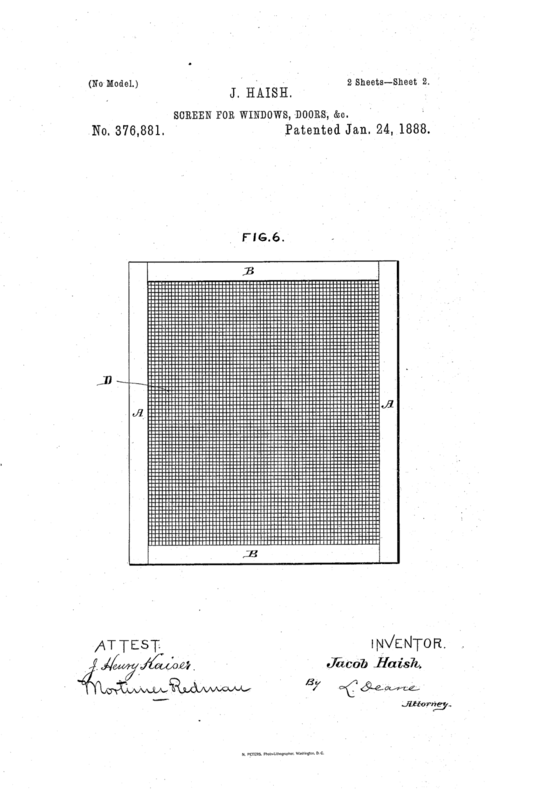 The patent below is for a screen for windows, patented in 1888. Click the images to enlarge. Excerpts from the patent papers are below. "There has been much difficulty and expense in the ordinary way of manufacturing screens for doors and windows by reason of the cost and trouble in making mortises and tenons in the frame, and inapplying a molding over the edges of the wire-cloth to make a good finish, and in securing the parts together neatly, cheaply, and firmly. 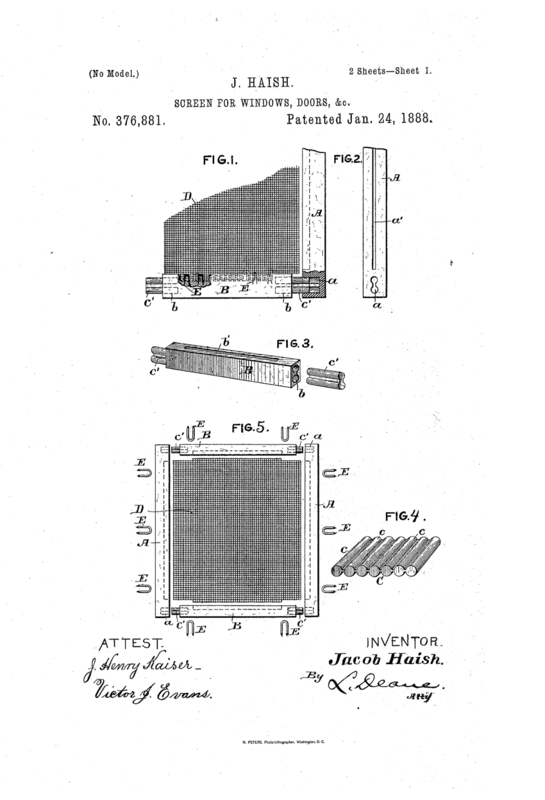 The present invention is designed to afford a screen that can be made very cheaply and easily, and when made will be very handsome in structure, and will also be of less bulk or weight than any of the screens now in use; and to this end my invention consists in making mortises by bor-ing holes in the adjacent faces or ends of each sill and rail and providing loose tenons to fit into said holes, and in making a slit or groove along the inner face of the rails and sills, and then in fitting the several parts together with the edges of the wire-mesh in said grooves, and securing the structure together by means of wire staples forced into the slots." 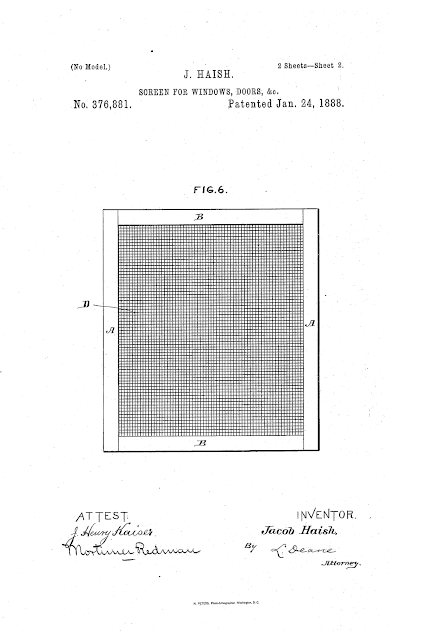 More of his patents can be found here.